Grammy® Award winner for Album of the Year! 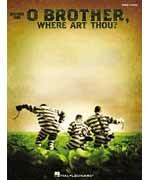 This unique songbook features piano/vocal arrangements of 11 selections from the critically-acclaimed Coen brothers film. The traditional songs for this film were selected by T-Bone Burnett to capture the sound of the early-'30s South.